The front: Hat is off so he can show off the perm. The back: Stapleton won those Player of the Month honors due to his 19-game hitting streak for Pawtucket. Later in the season he had a 19-game hitting streak for the Red Sox. 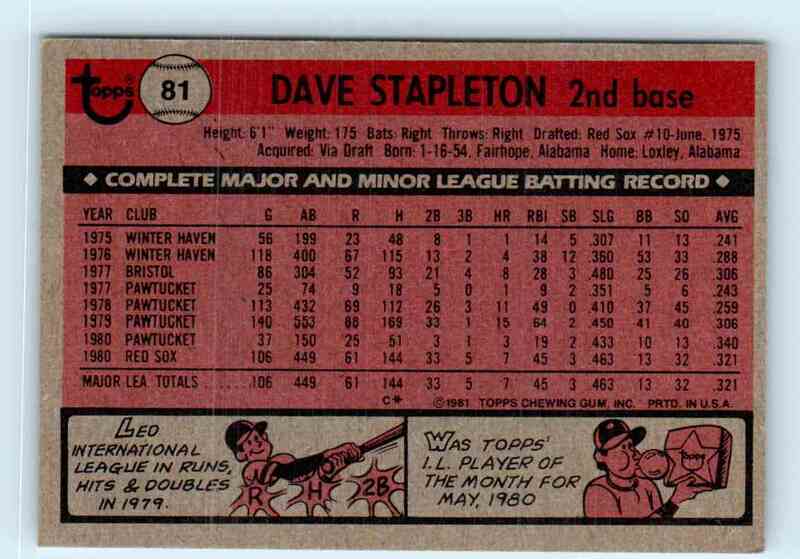 The player: Stapleton was the Red Sox starting first baseman from 1980 to 1983. He lost his job when the team traded for Bill Buckner, but he remained on the team, often serving as Buckner’s defensive replacement late in games. In Game 6 of the 1986 World Series, manager John McNamara elected to keep Buckner on the field instead of bringing in Stapleton, probably costing the Red Sox the championship. 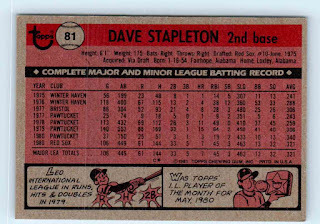 Overall in Stapleton’s career, he hit .271 with 41 HR and 224 RBI. The man: Stapleton now owns a homebuilding company in Alabama. My collection: I have 16 of his cards, from 1981 to 1987. 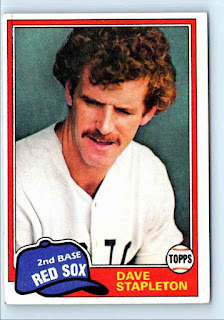 I would be interested in trading for 1982 Brigham’s/Coca-Cola Red Sox #19. This was a highly coveted card back then because of his MLB start. It'd go for insane ebay prices if that same scenario happened today.